ALL THE TIME GOD IS GOOD! : New Covenant Tithing? I have been stirred in my spirit to share a brief but important series on a major subject that is affecting the Body of Christ. I am confident in the Lord's desire to shed light on this topic and see people released into the freedom Christ alone brings. We will resume the previous study at a later time. For now, we are going to be addressing this issue of the New Covenant and the practice of Tithing. First, I need to lay the proper foundation to properly begin this study. If we have a faulty foundation then all we build upon will be unstable and prone to collapsing. The foundation of any study of the truth is, of course, the Word of God. The Word of God is the final authority. The Word of God is where true Radical Grace is discovered. It is where we find the beauty of this New and Better Covenant. It is the Word that reveals God sent His Son to take our place. It is the Word, that reveals by virtue of His blood, we are made perfectly righteous before God. That we are forever forgiven, cleansed from all our sins, eternally secure, completely acceptable to our God and made as worthy as Jesus to receive all He has promised. We place our trust in God and His Word. We place our trust in Christ's Finished Work. I am sharing the truths firmly established and rooted in God's Word alone, not man made ideology or philosophies of human reasoning or intellect. In this study, we are referencing authentic Grace, nothing else. To be clear, authentic Grace is what we have discovered in the Word. Ideologies and human philosophies like universalism, or the various philosophies of inclusion (all humanity is already in Christ apart from trust in Christ), ideas that God was never angry at sin or that a place of eternal separation called Hell is non-existent are not rooted in Scripture and are not authentic Grace. With this established let me state what this study endeavors to prove from Scripture. To once again be clear, we are not proclaiming a "grace hippie" idea. This study is in no way intended to prove we as Christians should be stingy, greedy, or never give or support God's work on this Earth financially. I am not against giving or donations or charitable work in the name of Christ. I need to establish this foundation because religious traditional strongholds are deep in the minds of so many concerning tithing. If we endeavor to reveal the truth of the New Covenant, many will simply dismiss it, saying we are ignoring the Word or deviating from it. We don't want to give them any reason to doubt the truth. Traditional mindsets will immediately declare, I wouldn't want to expose my ignorance by declaring tithing is an Old Covenant practice. Abraham tithed before the Law. 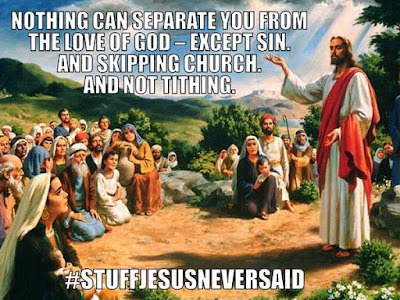 Therefore, tithing is for us today. Well, it is true Abraham did tithe before the Law. Abraham tithed his spoils of war to Melchizedek. We will discuss this in depth in a further study. However, it is worth noting that Abraham isn't recorded continuing to give a tenth of all his possessions. He gave a tenth one time, just once. Since we mentioned before the Mosaic Law, it is worth noting that circumcision was instituted before the Mosaic Law. According to some to establish if an Old Covenant practice is valid for us today in the New Covenant, we must see it in practice before the Law was established. Circumcision was established before the Mosaic Law. 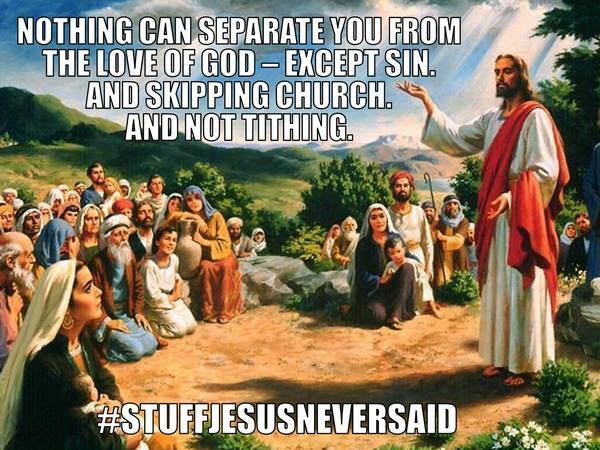 In fact, tithing is only mentioned four times in the New Covenant. All in the Epistle to the Hebrews, yet circumcision is mentioned twenty times in the Epistles. Certainly, we know from context circumcision is not required for us today. It is the same for tithing, biblical context is key to understanding this. The main point I want to leave you with today is why is tithing such a popular concept among many? Because many in the New Covenant don't understand rest. They want a part to play, they don't understand the New Covenant. This New Covenant is all about the Lord Jesus Christ. Yet through religious tradition and lack of grace understanding we make it all about us. That the New Covenant is contingent upon our faithfulness, our abilities to perform just right, even our consistency in giving. This New Covenant was a Covenant cut between God and God. We are the beneficiaries if we simply believe and freely receive what He accomplished. This is why our performance or faithfulness have nothing whatsoever to do with receiving or partaking of the benefits of the Covenant. We have much more to cover in this study. We will look at Jesus words about tithing. We will look at Hebrews 7. If anyone will just open their hearts and minds and without preconceived notions, they will see somethings from the Word they haven't seen or understood. We want to be gracious in this study. We aren't trying to be critical in studying this controversial topic. I'm just endeavoring to set the Body free to follow the Lord's guidance in love and not traditions of men.